Christian Radich was built by Framnæs Mech. Yard in 1937. 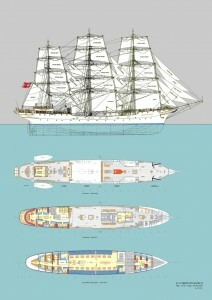 She was built as a sail training ship: the orlops (dormitories) had capacity for berthing 80-90 students (maximum 80 today after renovation), a large galley for learning to cook, carpentry training, and earlier there was also a machine shop on board (where the galley is now) for the training of engineers. 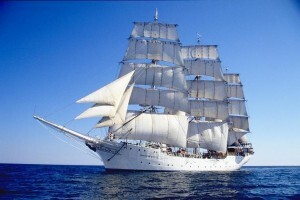 The purpose of the training ship was to train sailors. Sailing-ships were the usual vessels around the turn of the century and that is why the sailing ships continued as a school ship later on. Even though the initiator to build Christian Radich is often referred to as “Captain”, his profession was general manager of a saw mill and he was also part owner in another. However, he loved the sea, and it is said that he never got tired of listening to stories from his cousin who was a captain. Simeon Christian Radich lived from 1822 to 1889. His birthplace was Halden, but he lived most of his life in Oslo, at that time named Kristiania. Thus the ship is strongly associated with Oslo.